Actresses Joe Chen (陈乔恩) and Zhou Dongyu (周冬雨) attended the press conference of 'Fallen Tears (倾城之泪)' in Shanghai, China on July 21, 2011. Taiwanese actress, Joe Chen (陈乔恩) wore a floral satin dress from Dolce & Gabbana Fall/Winter 2011. Pity she opted for a pair of black pumps for the outfit. 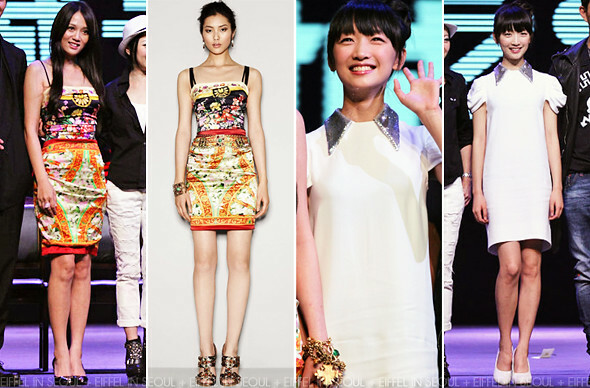 Zhou Dong Yu (周冬雨) opted for a white dress with sequin collar from Miu Miu. Accessorizing her outfit with a pair of white heels.